To lift, push the centre armrest up gradually in the direction of arrow . To lower, pull the centre armrest all the way up. Then lower the centre armrest. To adjust the position of the centre armrest, push the armrest fully to the front , or fully to the rear, until it engages. A centre armrest with a stowage compartment can be folded out of the middle seat backrest . To fold it down, pull the loop in the direction of the arrow . To fold it back, fold the centre armrest upwards and push it into the backrest as far as it will go. 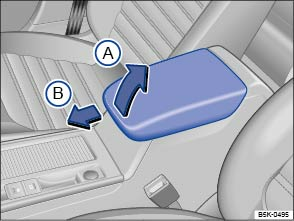 The centre armrest can obstruct the driver's arm movements. This can cause accidents and severe injuries. 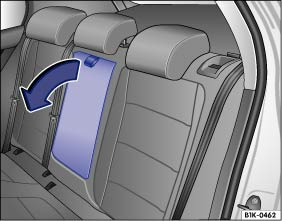 Always keep the stowage compartments in the centre armrest closed while the vehicle is in motion. Never transport an adult or child on the centre armrest. An incorrect seating position can cause serious injury. Never place hot drinks or fluids in the drink holders. These can be spilt during a braking or driving manoeuvre.